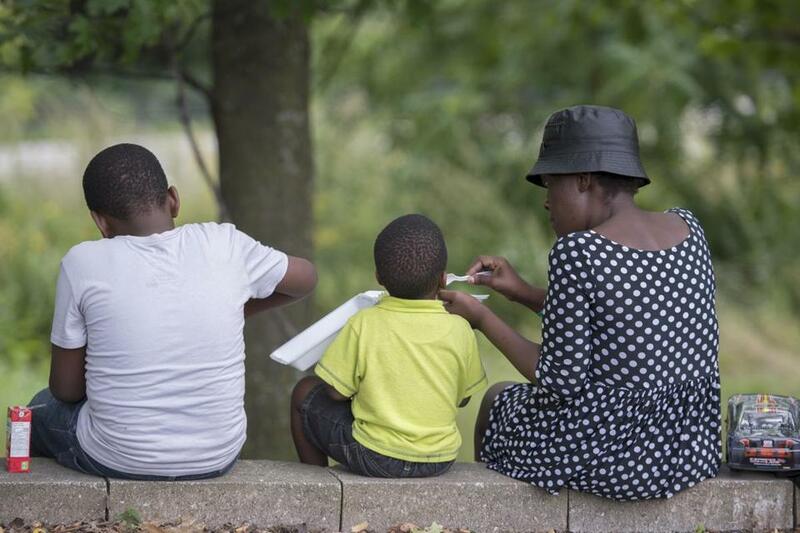 A woman and two children ate food handed out by an evangelical church in a park next to the Olympic Stadium in Montreal. MONTREAL — The young man’s desperate journey led from earthquake-ravaged Haiti to Brockton, Mass., and now to this city near the Canadian border, where he sat idle and anxious underneath the soaring tilted tower of Olympic Stadium. The man would not give his name, nor would any of the half-dozen other Haitian refugees who huddled recently on a concrete curb outside the home of the 1976 Summer Olympics, which is sheltering hundreds of an estimated 8,000 Haitians who have fled to Quebec from the United States since June. Propelled by fear of deportation from the United States, migrants seeking asylum have been streaming into Quebec illegally this summer — 781 were intercepted at the border in June, 2,996 in July, and 3,800 as of mid-August, according to the Royal Canadian Mounted Police, which arrests the migrants and directs them into shelters. But the hope of putting down roots in Canada — a hope often stoked by unfounded reports on social media — is likely to be dashed for many of the Haitians who have gambled their futures on an arduous and expensive trek north. Canadian officials said they do not know how many Haitians from New England have crossed the border, but the Boston area is home to the third-largest concentration of Haitians in the United States, trailing Florida and New York City. 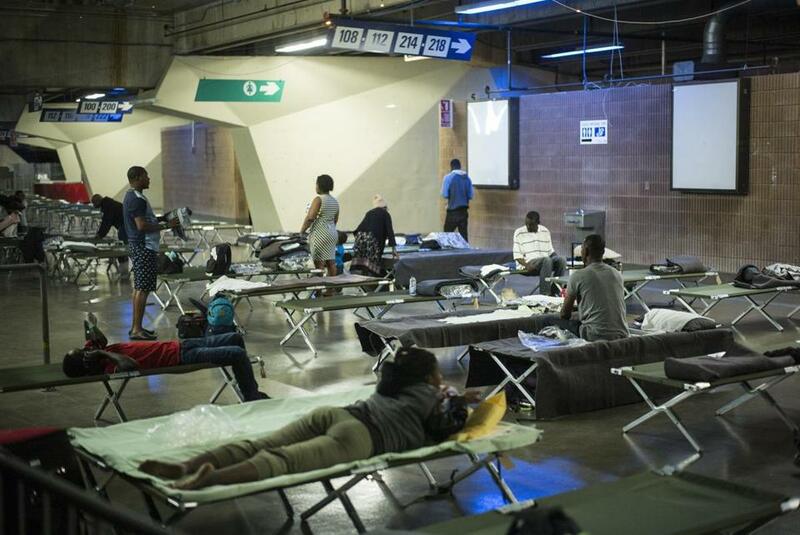 Olympic Stadium is sheltering hundreds of an estimated 8,000 Haitians who have fled to Quebec from the United States since June. The exodus followed an announcement in May by the Trump administration that a program that has offered refuge to Haitians since the 2010 earthquake would be extended only until January and that the refugees should prepare to leave. But rather than make arrangements to return to Haiti, which is still recovering from the earthquake and a catastrophic hurricane in 2016, many are choosing to flee to the province of Quebec. Canada grants asylum only to about half of those who apply, after a long and strict process has become more time-consuming with the crush of new cases. Simply walking across the border, no matter how difficult the journey, does not guarantee a happy outcome. “They have been given false information. They thought that Canada was wide open,” said Chantel Isme, vice president of the board of directors at Maison d’Haiti, a community organization in Montreal that is helping new arrivals. One widely circulated rumor suggested Canada would cover all immigration costs. Other online postings cited Prime Minister Justin Trudeau’s statement in January — “To all those fleeing persecution, terror, and war, Canadians will welcome you” — as evidence that they would, indeed, be welcomed. Trudeau’s comment came amid international backlash to President Trump’s proposed ban on refugees and immigrants from certain countries. Seven months later, Trudeau clarified his stance as illegal crossings into Quebec reached about 250 a day, many of them at the spot where a narrow rural road in Champlain, N.Y., ends at the Canadian border. However, flouting the rules has allowed Haitians who cross illegally to remain in Canada, at least temporarily. If they had tried to enter legally at an official border station, they would have been turned back under a pact that requires refugees to seek asylum in the first safe country they enter — in this case, the United States. Now, the Mounties wait just across the border from Champlain to intercept a steady stream of refugees, about 85 percent of whom are Haitian. They are arrested, patted down, and undergo criminal background checks before they are sent to shelters to await a one-time monthly stipend of about $500 (US) for an adult. 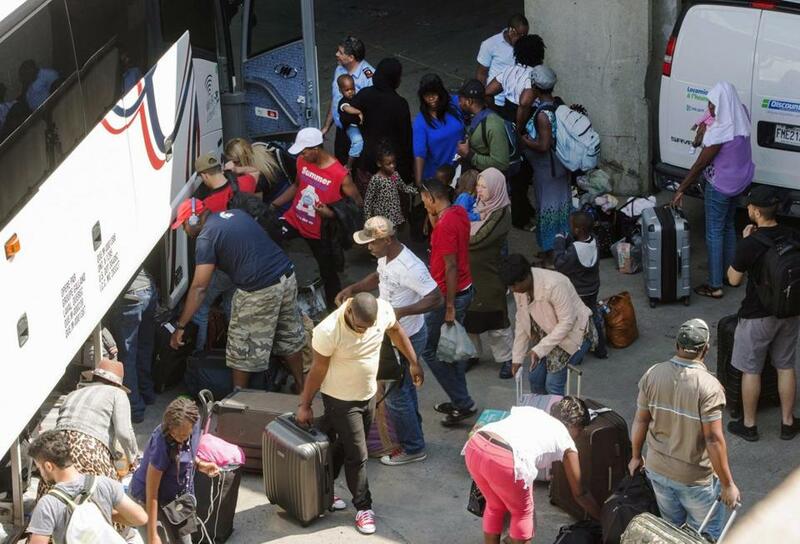 Propelled by fear of deportation from the United States, Haitian migrants seeking asylum have been streaming into Quebec illegally this summer. After receiving the check, the refugees are asked to leave the shelter, find a place to live, and apply for a work permit while they wait for a decision on asylum. To be granted asylum in Canada, an applicant must show that his or her identity — because of political, religious, racial, or other reasons — makes returning to Haiti dangerous. A damaged home is not enough. The migrants who have crossed since June represent a significant portion of the 58,000 Haitians who have lived in the United States under Temporary Protected Status, which was granted after the earthquake killed more than 100,000 people in that impoverished nation. About 4,700 Haitians with that status live in Massachusetts. Reilly, the Boston lawyer, said many Haitians in the United States are probably unaware they have the right to judicial review before they can be deported. And with US immigration courts also backlogged, Reilly said, a case might take more than a year to resolve. “A lot of them do not understand that there is a constitutional protection where they cannot simply be kicked out,” Reilly said. Gaining the same result in Canada after a similar wait could come at tremendous cost — families uprooted from the United States, jobs abandoned, and schools left behind by children who often know no other country. Quebec offers Haitians a familiar language in French, as well as support among 120,000 Haitians who already live in the province. But at Olympic Stadium, the mood among many refugees appeared dark and disoriented. Questions about their journey were met with silence or suspicion. What comes next is often out of their control, but the humanitarian response to their plight has been robust. The provincial government and nonprofit groups such as the Red Cross help with shelter and other basic needs, and individuals are stepping up. A Montreal pastor and his wife, Elysee Isidor and Micheline Enade, have been bringing food to the stadium every day. On one recent afternoon, Enade held a jar of peanut butter and a bag with rolls for the refugees. As Haitians themselves, they can relate. “We treat them like brothers and sisters,” said Enade, whose husband leads an evangelical congregation. Another Haitian woman, holding a toddler, approached the stadium gate to meet relatives there. Her country, still recovering, holds no attraction for her now. She understands why others feel the same. 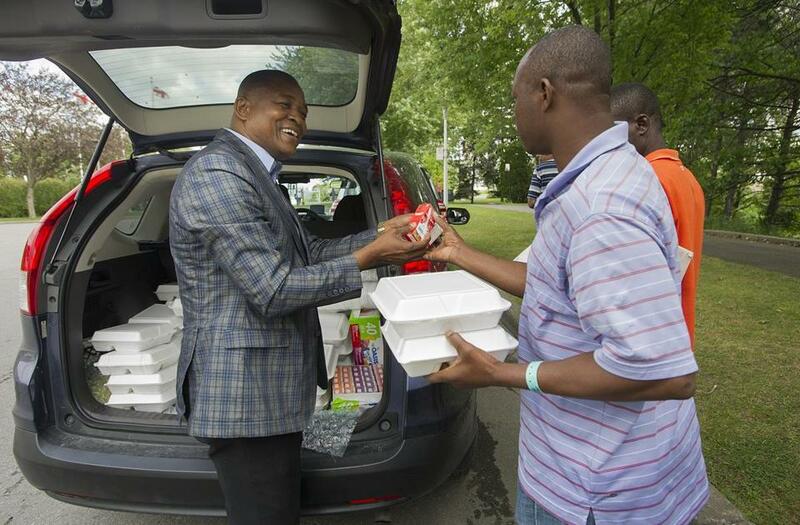 Pastor Elysee Isidor (left) handed out boxes of food to Haitian asylum seekers in a park next to Olympic Stadium. Isidor and his wife bring food every day.